Once again, I got bored and started screwing around in the kitchen. And once again, I created magic. 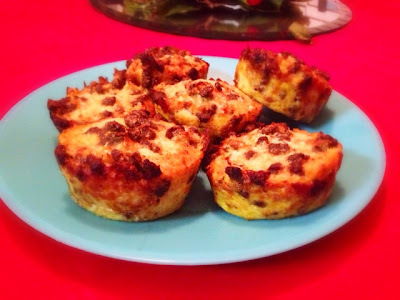 If you're like me and you're constantly rushing in the morning while trying to figure out what to eat for breakfast, you'll love these little muffins I came up with. And of course, they're low carb. and 1/2 cup shredded cauliflower. (The thought had also occured to me to add a little bit of melted cream cheese- unfortunately I didn't have any on hand at the time-- if you try this recipe with the cream cheese, please feel free to let me know how it turns out!) Once you've mixed well, evenly distribute the mixture into a well-greased muffin pan and cook on 375 degrees for 30 minutes. Once you take them out of the oven, be sure to let them sit for at least half an hour so that they have a chance to cool. And ta-da! You have a quick and easy, low-carb breakfast! These muffins are easily refrigerated, and they only require 30 seconds in the microwave to be warmed up. Like the though of no carb since that's how I lost some weight and those feeding me at the moment don't have to watch their weight! Thanks for sharing.